There are few internet institutions which have had the prosperous life of parody news outlet The Onion; the actual, hard-copy newspaper was founded at the University of Wisconsin-Madison in 1988 and, in the early 90’s, the organization was ahead of the curve with an internet presence unrivaled even by some of the country’s larger “actual” news sources. In fact, I can personally think of very few websites from 1993 which even still exist today, much less parlayed their schtick into what seems to be a nationwide coup to infiltrate and jab the news establishment. But let’s face it, you’re probably very familiar with The Onion, and well you should be. The Onion practically invented the entire “fake news” medium, which has not only been ripped off gratuitously over the last twenty years, but which today has become a legitimately new genre of humor. Truly nobody does it with the relish of The Onion, a perfect mockery of current events and culture (past headlines have included “Drugs Win War on Drugs” and “White House Slam Dunk Contest Results in No Slam Dunks”). The outlet has even cultivated additional parodical elements winking at no-nothing editorial pieces, fluff infographics and “man on the street” opinion segments. Not content to just stick with roasting newspapers, however, the Onion branched out organically into a series of web shorts on the site known as the “Onion News Network,” and it’s actually rather surprising that it took this long for it to make it to our television screens. Now it has, with a vengeance, in two shows on different networks: IFC’s Onion News Network and Comedy Central’s The Onion SportsDome. The Onion News Network, which pairs on IFC’s late night lineup with the likes of Larry Sanders and Mr. Show reruns, features Soledad O’Brien-esque model/anchor Brooke Alvarez (actress Suzanne Sena) throwing to a lineup of fake pundits, experts and news correspondents. A recent and timely episode featured a meteorologist describing the glut of snowstorms blanketing the country with faux-alarmist aplomb, but taking time to note that “there are still some assholes in Ohio riding around and having fun on snowmobiles,” insinuating that they should suffer a horrific accident for not taking the snowfall so lightly. Don’t those snowmobilers know what’s at stake? The joke, of course, is that these blizzards aren’t the end of days, no matter how seriously our nation’s newsmen and women want to create it to be, and Onion News Network barely takes a beat to recognize the joke before it’s piling on bon mots one upon the other in its own snowball of humor. ONN is truly fit for the DVR, as the jokes come so fast and furiously that you may find yourself barely registering a joke before you’re in the midst of the next one. You snooze, you lose. You have to bring your A-game to watching this show. Sena’s Alvarez likewise fires off look-at-me arrows with straight-faced vigor, noting at the end of one segment with a frumpy correspondent that “You know, I have some suits I’m not using anymore, if you want them.” It’s a send-up of cosmetic news, where beauty trumps content, and it’s nearly pitch perfect. 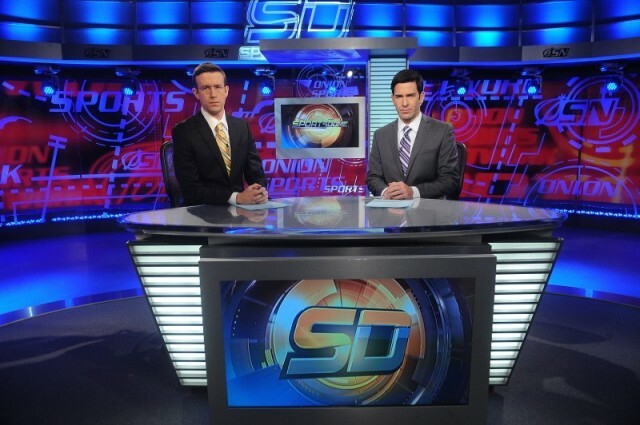 The Onion SportsDome, over on Comedy Central, is a little more niche — an ESPN Sportscenter knock-off complete with two hipster hosts spewing idiosyncratic cultural references as they report on the day’s sporting news. With brutal but clever, “breaking” top stories like “The L.A. Clippers have just traded four million dollars in cash to the Portland Blazers for six million dollars in cash,” SportsDome is a solid spoof of the ridiculousness of today’s sporting landscape. Several of the bits land their punches, such as a spot-on, stylish “Inside the Bench” segment heralding how high school football documentaries are a way of life in a small Texas town; other punch lines seem belabored and go on too long, like a recurring bit in one episode about a teenager breaking a masturbation record. SportsDome is best when it straddles the line between absurdity and reality (like a headline of the Milwaukee Brewers being repossessed in the middle of the night), but when things get too silly, it threatens to lose its audience. This latter point is probably the strongest point to be made about both SportsDome and ONN; occasionally both shows’ gags seem like recycled bits from the website or paper and don’t translate too well when extrapolated into longer, dedicated segments. The Onion has made its name on quick-hit jokes and headlines that are in and out with a quick wink, and it’s a treasure to discover them in print — but sometimes calling out those same jokes in giant red letters dilute the joke. A recent gag about man-horse marriage on ONN was a perfect example; it should have stayed a headline. It would have been funnier that way. One of the greatest assets of both programs, however, is that the production values are impeccable. My wife, for instance, actually thought I was watching Sportscenter one evening until a brief teaser of “Major League Baseball asks Manny Ramirez to shut down his ghost hunting organization” tipped her off otherwise. Both ONN and Sportsdome are to-the-letter, dead solid imitations of the source material being ribbed. This is what will impress you first, likely. There’s been a lot of time spent on recreating these mediums, and in that respect both are brilliant. From the opening graphics to the on-screen tags and crawls, it all looks quite phenomenal. In the end, both ONN and SportsDome are solid, despite the fact that most of the content would be just as funny if read online. It seems like a long way to go just to “give it” to television broadcasting, but it’s a lot of fun, very quick, and tremendously smart. Ultimately, it’s The Onion doing what The Onion does best — make something incredibly fake look incredibly real. And let’s face it, it’s a lot more fun than watching the real news, isn’t it? At least with The Onion on the job, you won’t go to bed as horribly depressed as you would by watching your local NBC affiliate. Consider these knock-offs a fraud worthy of your time, even if you won’t learn much.